Lassie and Timmy; Scooby Doo and Shaggy; Baxter and Ron Burgundy; Bubba and James Wathen. You may not have heard of that last duo yet, but when it comes to the bond between a man and his dog, it's the realest of the bunch. After James was hospitalized more than a month ago in Kentucky, staff were puzzled when his condition dramatically worsened and he quit eating. 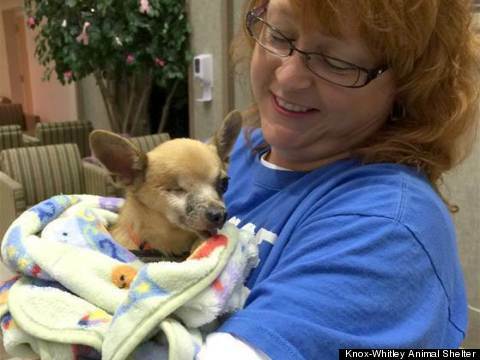 That's when they realized the 73-year-old just missed his dog, a one-eyed chihuahua named Bubba, who'd been turned over to the Knox-Whitley Animal Shelter, WKYT reported. James and Bubba, together again. Turns out Bubba was missing James, too. "The dog quit eating a week ago, which is very strange," Mary-Ann Smyth, the president of the animal shelter, told Today.com. "The dog didn’t know where James was and James didn't know where the dog was and believe it or not, they both stopped eating at about the same time." Once they realized how harmful the separation was to both man and dog, and despite a hospital rule barring animal visits, staffers at Kentucky's Baptist Health Corbin tracked down Bubba to reunite him with James. 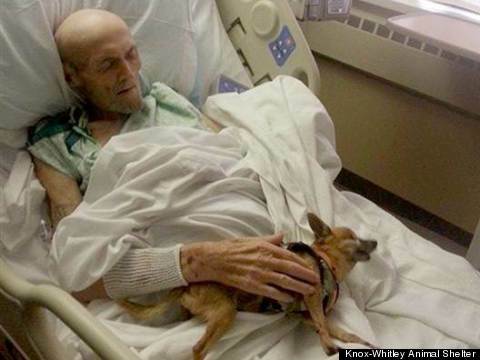 "We pulled out all the stops and found the dog," Kimberly Probus, the chief nursing officer at the hospital, told WKYT. Last Saturday, the two were finally reunited, and both have made "a complete turnaround," Smyth told Today.com. "He was so sad at first. We had him wrapped in a baby blanket and he was shivering," Smyth recalled of the reunion. "The minute we got about 20 steps from this guy’s room -- I kid you not -- his little head went up. His eyes got real bright and he was like a different dog." "When Bubba was handed to James he started to cry and then Bubba started to snuggle James," the animal shelter added in a Facebook post, "it makes you realize that animals are not just pets they are loved ones." In an update posted to Facebook on Tuesday, the shelter wrote, "Both [Bubba and James] are so happy to see each other and both seem to be doing better! The power of love can go a long way!"